Have Domino's finally cracked the car oven concept? We've already heard that Domino's has started experimenting with drone technology, but their latest development revolves around a new delivery car that can hold 80 pizzas and keep them piping hot straight to your door. Earlier in the week Domino's announced that they will partner with GM, Roush and Local motors to create a purposeful delivery car with the sole purpose to fit in as many pizzas as possible to deliver straight to your belly. Domino's new meals on wheels vehicle dubbed as the 'DXP' is based on a Chevrolet Spark but its interior has been stripped down to accommodate more pizzas and behind the drivers seat will feature the all-important oven. 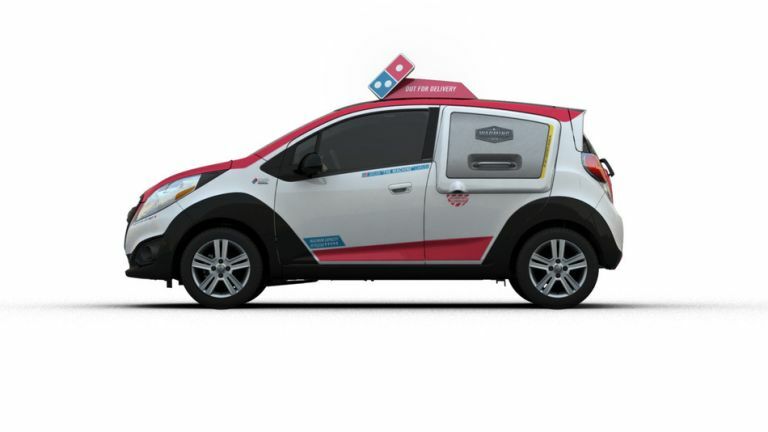 Domino's are claiming these cars can hold up to 80 pizzas, and will have separate compartment for drinks, wings and napkins. Want to know what your own car will look like in 30 years? We might have the answer. The DXP will also house a 1.2 litre engine, so unfortunately delivery times are unlikely to be any shorter. The cars will also come equipped with a puddle light based on the roof of the DXP, that will project Domino's logo on the road -just in case your looking out the window and struggle to find your pizza delivery car. The first DXP's will be rolled out in major cities across the US in the next three months with franchise owners being able to nab one for $25,000 (£16,325). The cars will likely reach the UK within the next five months. Pizza ovens in cars have notoriously been a terrible tech idea, with car batteries being drained and rogue fires occurring, but Domino's seem pretty confident that their warming oven isn't a disaster waiting to happen.